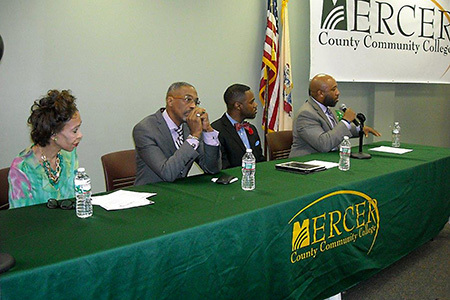 Trenton, N.J. -- A robust panel discussion was the highlight of Mercer County Community College's (MCCC's) Dr. Martin Luther King Jr. tribute, held Monday at the James Kerney Campus (JKC) in Trenton. Panelists Darren “Freedom” Green, Bishop Gary Sean Mullings, local businessman Tracey D. Syphax, and Trenton attorney Lynn Suzette Price weighed in on the topic “All Lives Matter.” The discussion encompassed concerns on the national level, as well as current issues facing Trenton some 50 years after the civil rights successes of the 1960s. 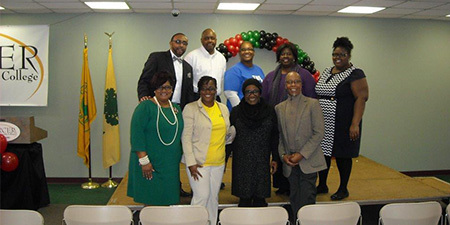 Close to 100 visitors attended the event, which also included thought-provoking poetry by several Youth College students and a tap dance performance by student Quenten Couch, of Ewing. The MLK Day committee included JKC Provost Monica Weaver and staffers Corvena Denton, Lucia Brown-Joseph, Alvyn Haywood, who served as moderator, Craig Morris, Brian Cody, Stacy Denton, Diane Romulus and Veronica Werner. 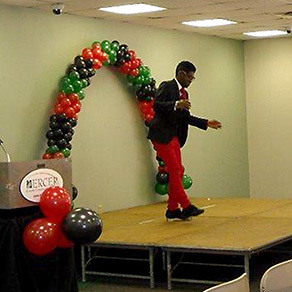 Quenten Couch dazzled the crowd with his tap dance performance. Committee members, front row from left, JKC Provost Monica Weaver, JKC Provost Monica Weaver, Corvena Denton, Lucia Brown-Joseph and Alvyn Haywood; back from from left, Craig Morris, Brian Cody, Stacy Denton, Diane Romulus and Veronica Werner.